The proper maintenance of your residential, commercial or industrial air conditioning is important to the system’s longevity and also the overall efficiency in energy savings as well as environmental impact. Inadequate Air Con servicing Cape Town wide and even in the surrounding areas may mean you experience costly problems whereby the internal circuitry or parts wear out much quicker, leaks come about or the unit begins to make louder noise. Luckily, we don’t just supply and install air conditioning systems but also have a big service section that can help come up with a regular servicing contract. With the most recommended aircon repairs Cape Town wide, you can select your preferred method of maintenance. More like car servicing, the much attention you give it, the longer life it will have and the less it will cost you. Provided you abide by a once per year service at least, the working of the unit and its internal components will continue to run effectively and efficiently, cooling the specific space or room in your home and keep your electricity cost on the minimal. 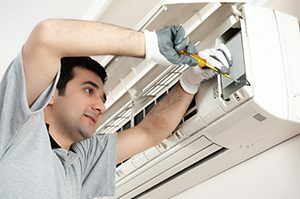 Failure to maintain any AC system can result in expensive repairs or even complete unit replacement. If you’re experiencing a difficult situation whereby your Air Con stopped functioning, we are here to offer our reliable assistance. Our repair technicians are well trained on all models and makes of AC system and are conversant with all manufactures. We stock an extensive range of circuit boards, replacement remote controls, filter, ducting, condenser units as well as spare parts to make sure your problem is addressed quickly. There is no fun in the aircon having issues and leaving you all sweaty and uncomfortable, and our accredited Air Conditioning contractors are fully aware of that. However, do not worry: our aircon repairs Cape Town team is available throughout to offer AC emergency services. We also offer reliable car aircon repairs Cape Town services. Get in touch with our expert team on 087 551 0627 today for the most reliable Air Conditioning repair Cape Town wide.